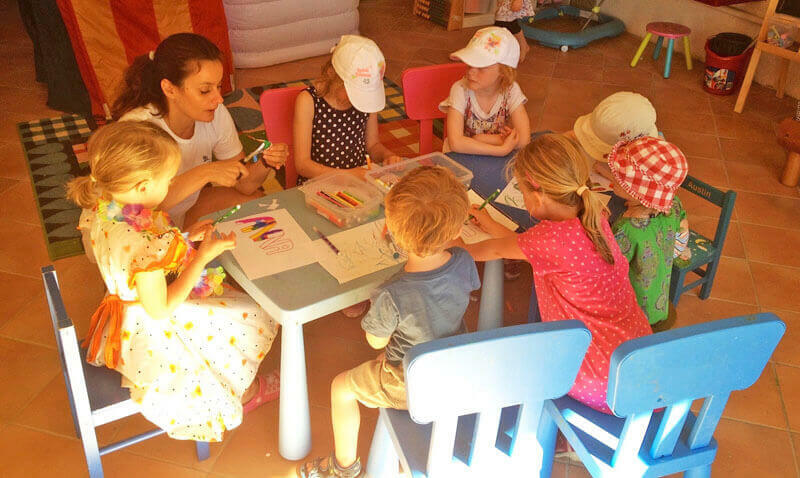 Step One – Morning: Enjoy our Kids Club. Loads of fun and activities for our lovely guests. Step Two – Afternoon: jump in our heated pools. The kids will never want to leave! Step Three – Head to the nearby sandy beaches. Why be stuck in the country with your kids? 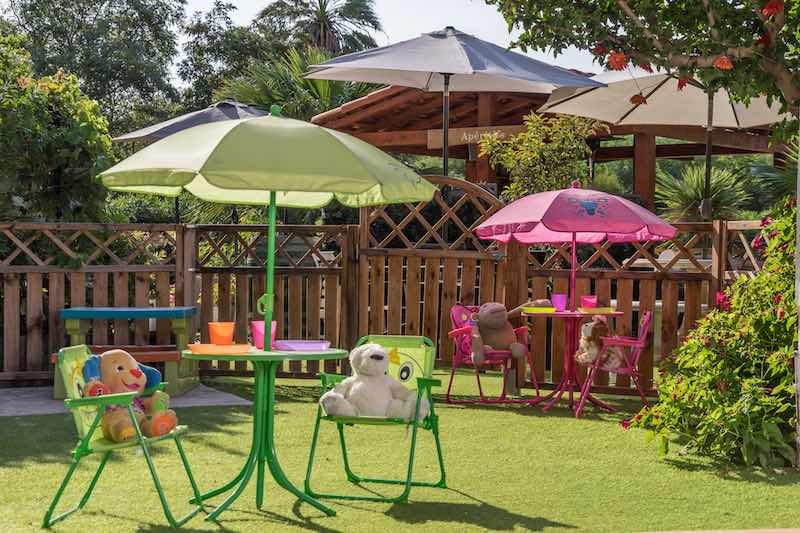 Imagine Roussillon strives to be the best family friendly resort in the South of France. Our kids club is a big part of this and we’re very proud of it. We offer a structured entertainment programme, but with the flexibility and personal attention that comes from welcoming just 6 families per week. Activities vary each week according to the ages and personalities of the children. Face painting ♥ fun with clay ♥ garden games ♥ treasure hunts ♥ nature trails ♥ Lego ♥ crafts & sticking ♥ rôle play games ♥ French lessons ♥ stories under the enchanted tree ♥ dressing up. Our drop-in kids club is for toddlers aged 2 up to older children of 9 and they will be queueing up to come in each morning! We just ask that you stay on site whilst the kids are with us. Please see our FAQ at the bottom of the page for more information. 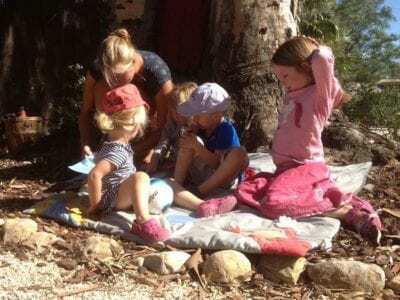 Read this article for idea of a toddler’s view on their holiday! Maybe you’ll sit at the café bar with a book and a coffee? 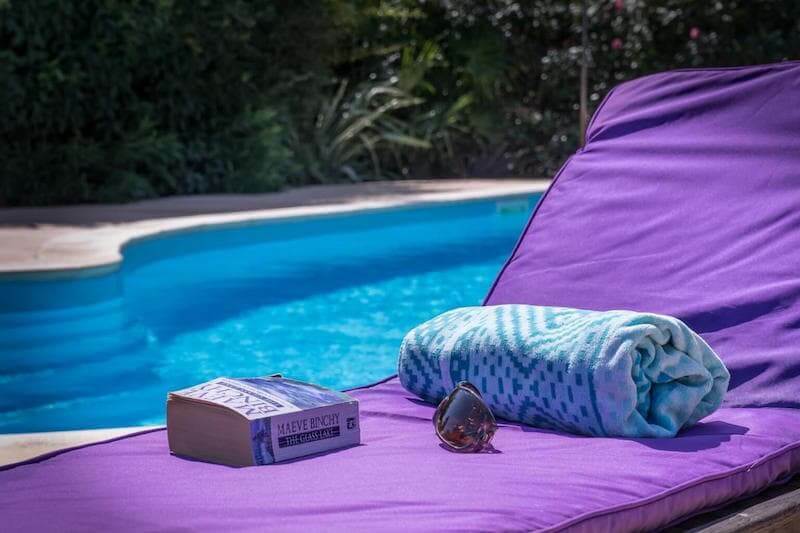 Or how about a spot of sunbathing at our lovely pool complex? The pools tend to be pretty much adults only during the mornings, so make the most of it during your stay! Here’s an added bonus for parents. During our meal night on Monday evening, kids club is open too. This means that kids eat together and parents eat together. 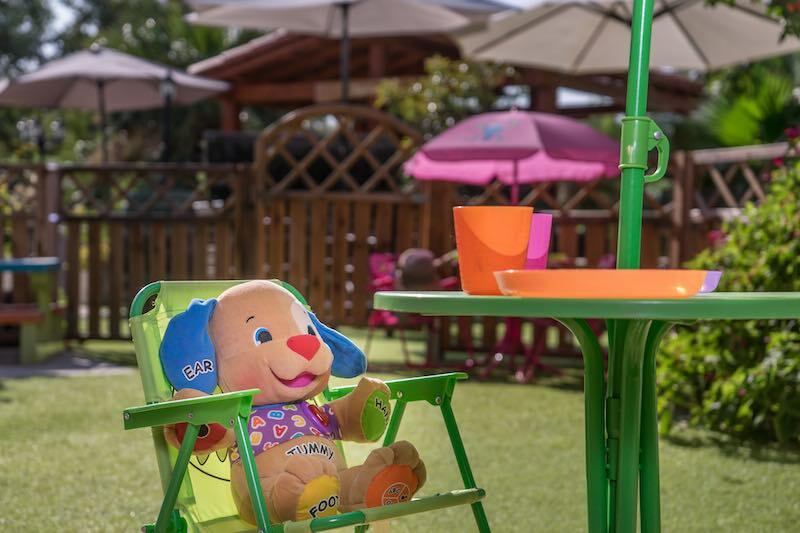 The adult dining terrace is within view of kids club, so you can keep an eye on the little ones if you want to. 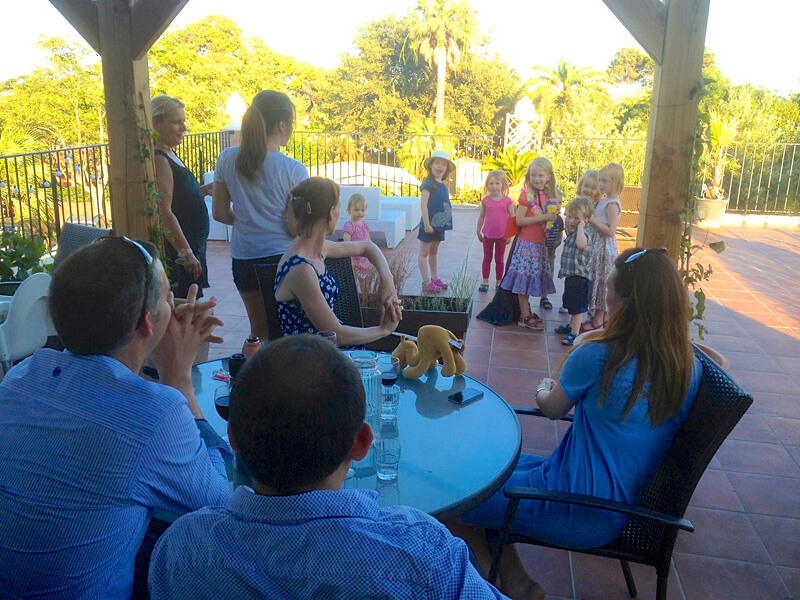 As we have staff on hand, you can relax and enjoy some adult conversation, safe in the knowledge that your children are having a great time and being entertained by our staff. Always remember that you can request (for a small fee) an additional babysitter to look after your baby during meals or at any other time. Guests sometimes want the freedom to go out as a couple during the day and this is a great way to do it. What ages of kids do you accept? Ages 2 and over, although you are welcome to come in with younger children and play with them. 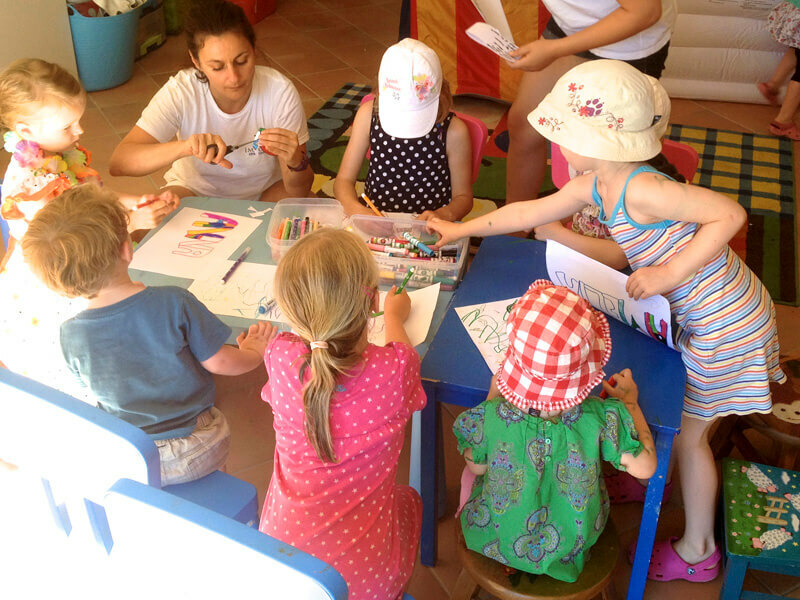 It is important to stress that your children must want to come into and stay in kids club – we want them and you to be happy! What activities do they do? A large variety of different things as mentioned on this page, but we tailor each session according to the personalities of the children in attendance. Are you a baby friendly resort? Yes! 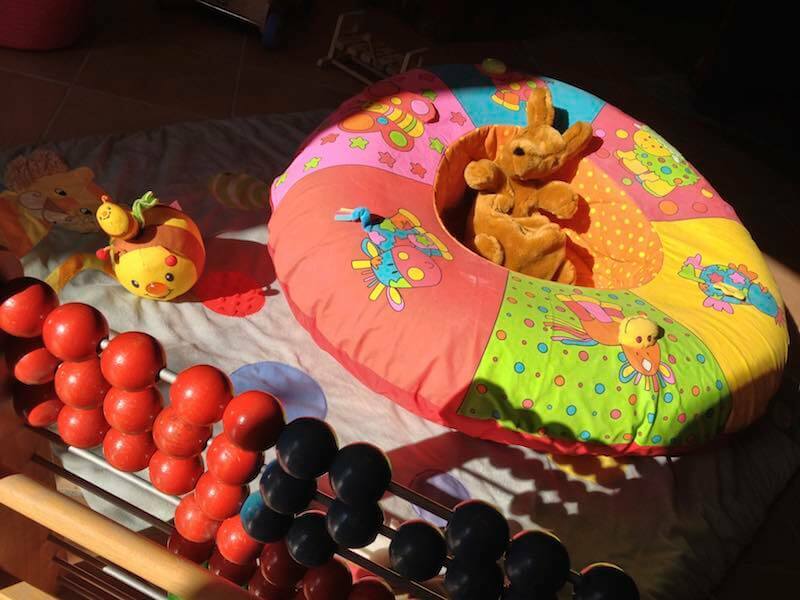 Our babysitting service in your apartment is for all ages, and we have many baby friendly facilities in all apartments. We even have a baby pen in the gym! Please contact us for specific details. What if you’re taking your baby abroad for the first time? Are you an accredited crèche? 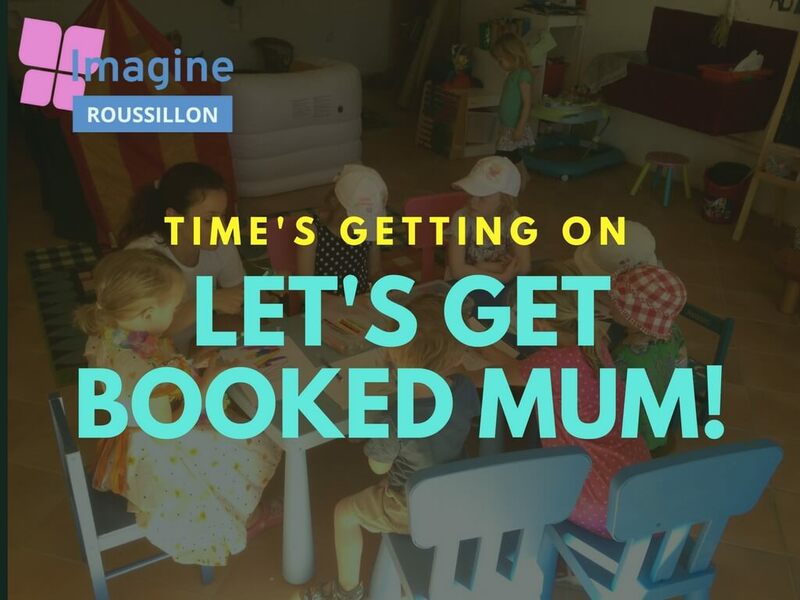 No, we offer supervised play and entertainment for toddlers/children aged 2+ at Imagine Roussillon whilst their parents relax on-site. The idea is simply to give you a break and give the kids lots of fun. Our staff (all of whom we know personally) are either mothers themselves or have experience entertaining and supervising children. Can we leave the site? For insurance and safety reasons we insist that at least one parent remains on site whilst their children are in the kids club. Will the kids enjoy it? We hope so! We offer a wide range of fun activities for the children, and as we are such a small facility we can easily adapt our programme to suit the children each day. 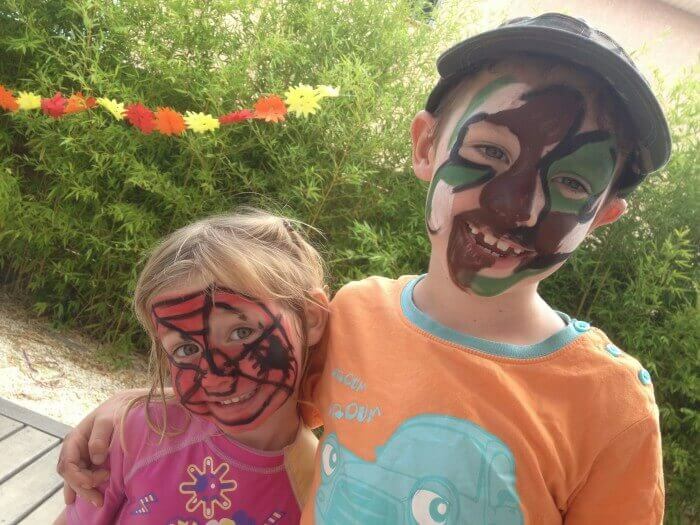 Are you similar to other country style kids resorts in France? 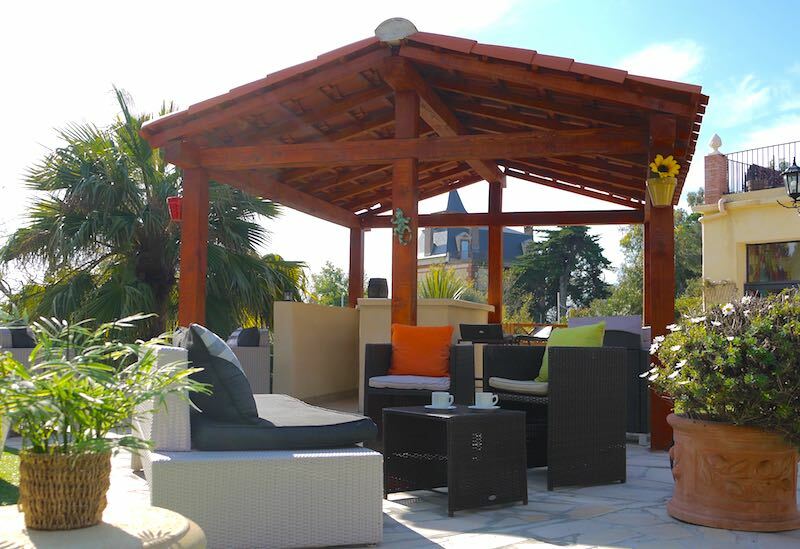 There are other specialist resorts who offer a similar concept, but often at a much higher price than Imagine Roussillon. 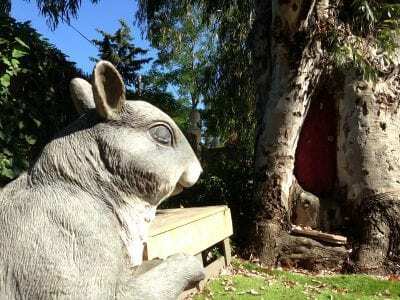 Also they tend to be a long, long way from the beach. 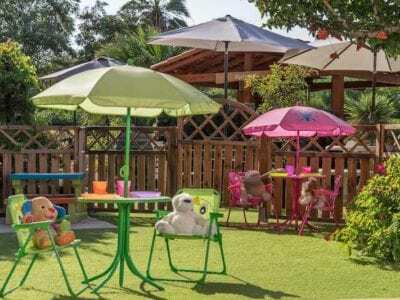 One particular specialist child-friendly resort has threatened us with legal action if we dare to compare ourselves with them, so we must be doing something right! Do you offer a luxury holiday experience? Luxury but not opulence! 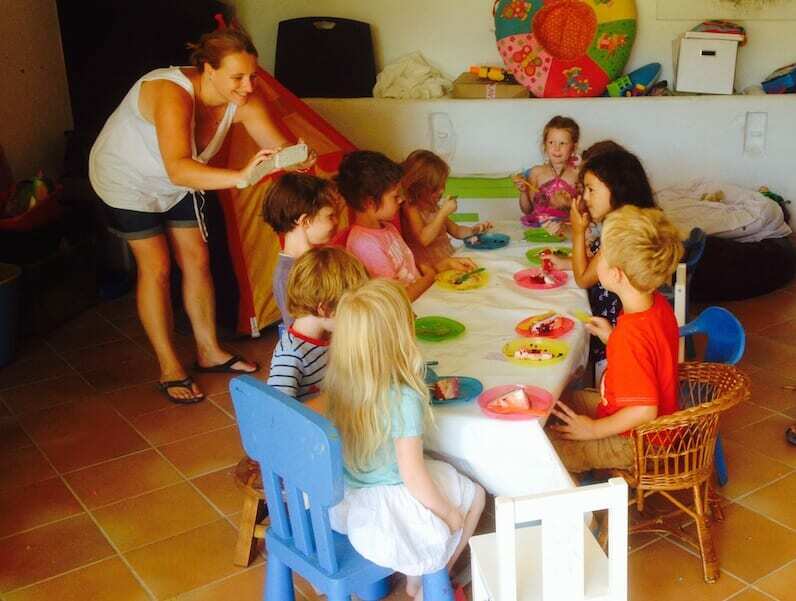 We offer great facilities which give you and your young offspring extra comforts. Air-con, heated pools, wifi, great coffee and so on. When it’s all put together, we hope you feel at least a bit pampered! We include a night of babysitting for you (May-September, no age restrictions – includes babies and toddlers!) 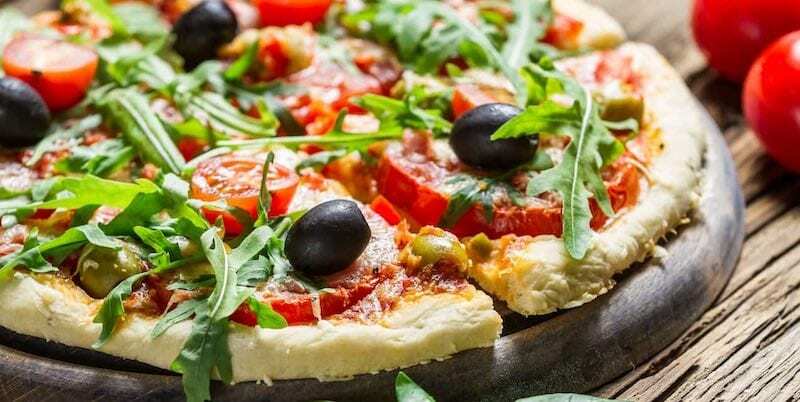 so you can nip away and have a meal in one of Canet or Perpignan’s amazing restaurants – don’t worry, we’ll phone you if there’s any problem. Our babysitters are all known to us personally and most have looked after our own young children at various times. They stay in contact with us during the evening to ensure everything runs smoothly. For 2018, we offer one night’s babysitting in all seasons (your own babysitter in your own apartment) plus a second kids club film night during July & August where you bring your children to kids club at 19.00. 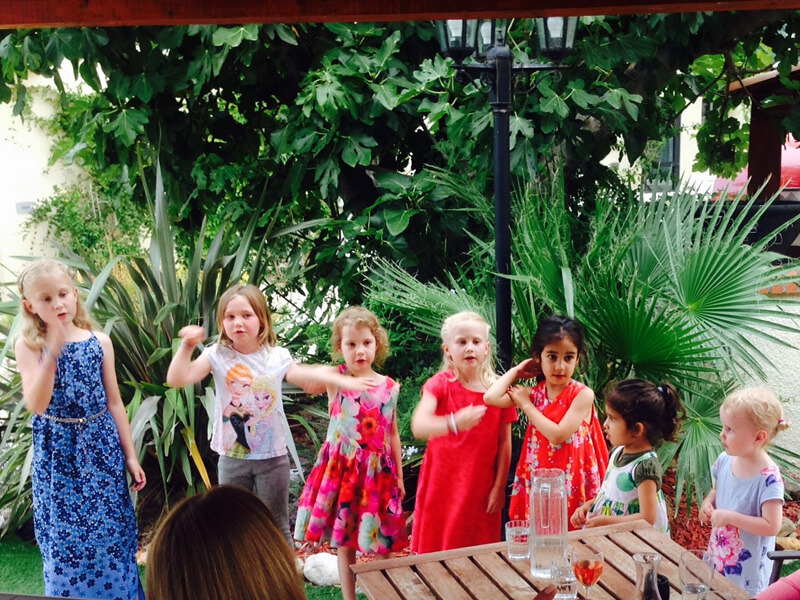 The staff then keep an eye on the little ones whilst you enjoy a glass of wine at the bar or on your terrace. Please note that the film night is for children aged 2 and over – please contact us for further information. 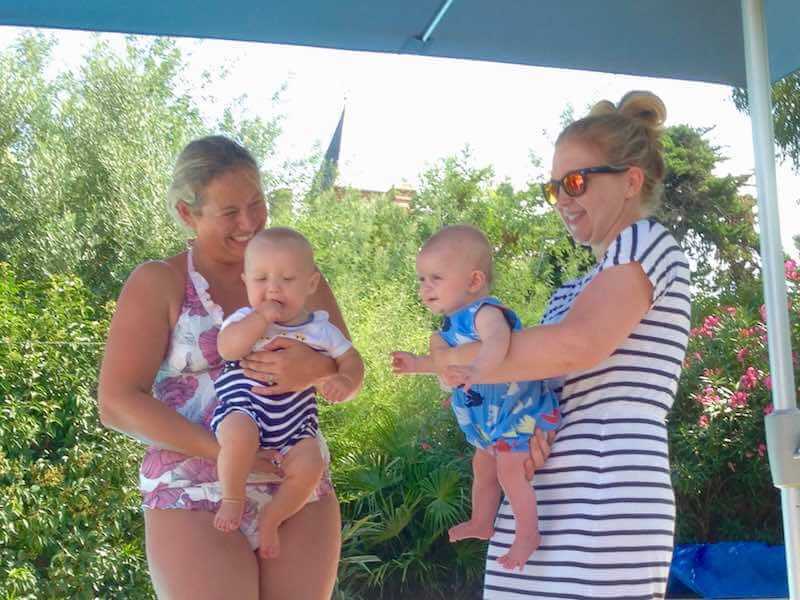 Our aim is to help you relax – after all it can be stressful if you are bringing your baby or toddler abroad for the first time. Remember that our meal nights also have kids club staff on hand, in order to take the pressure off and help you relax! Kids eat in kids club and parents eat nearby – and within view – at the bar. We’re small and family-run – but with that professional touch that’s really hard to find elsewhere. The South of France is full of impersonal hotels, but a true baby friendly bolthole where you can feel at home during your stay is as rare as hens’ teeth. Need help booking a restaurant? We’ll help. Baby crying and you need a break? Come to the bar and we’ll make you a coffee. Imagine Roussillon feels like a home-from-home. 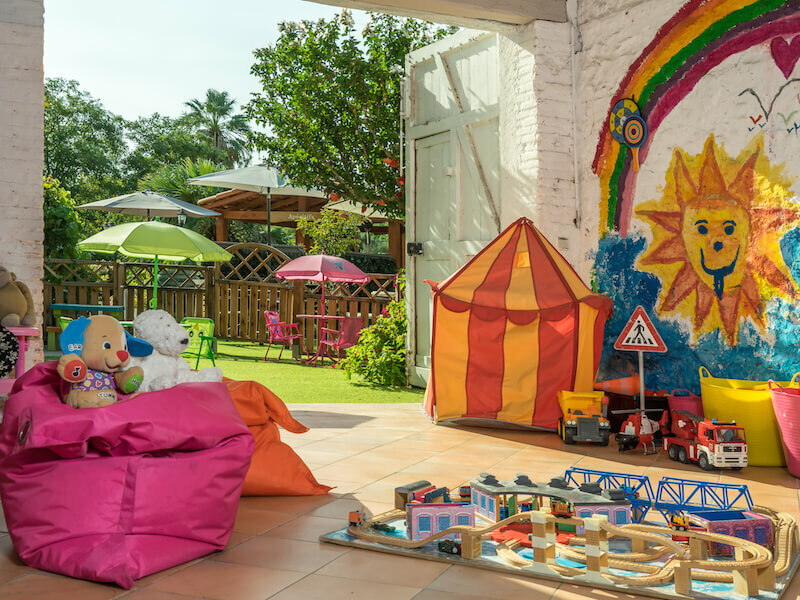 Guests say that they feel instantly relaxed here, not least because their babies, toddlers and older children are safe and happy. 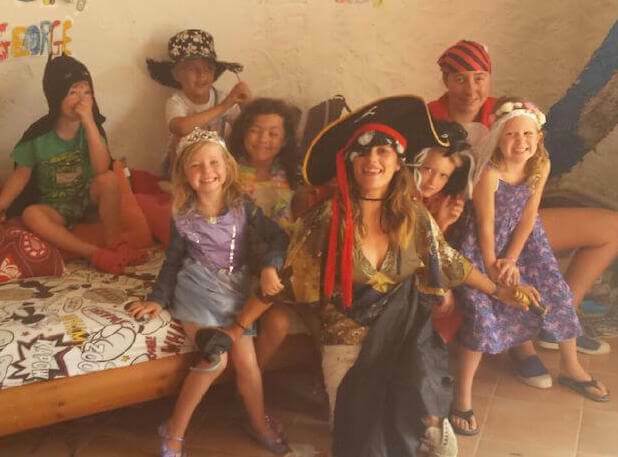 Lots of companies offer you a specialist family friendly holiday, but very few deliver. A lot of that is to do with service – personal service. We offer that in spades here – whether it’s in the kids club, the fitness studio & classes or with our complimentary concierge service. This finely-honed combination of location, facilities and service is what we do best.